Approved by NRA because of their consistent, never varying readings in 1/4 lb. (4 oz.) increments. 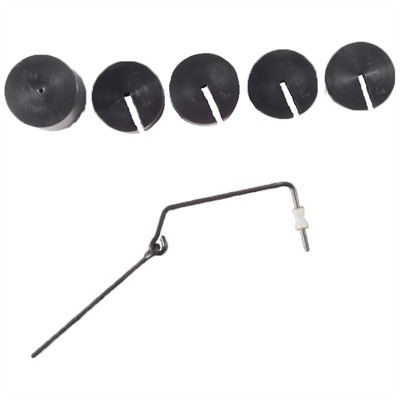 Ideal for match referees and gunsmiths tuning triggers for match shooters. The roller on the trigger hook guarantees weight will always be on the center of the trigger curve ensuring repeatable readings. Optional 24'''' Long Trigger Weight Rod adapts the weight set for use with rifles or full stocked handguns and adds 1/4 lb. (4 oz.) to base weight. Mfg: Custom Gunsmithing, Inc. SPECS: 2'''' (5cm) diameter weights. 5'''' (12.7cm) long hook. 11 1/2'''' (29.2cm) long overall. Blue steel. Optional Long Trigger Wt. Rod; 24'''' (61cm) lg., 1/4 lb. (113kg) wt. Set includes: 2 lb. (.9kg) base w/hook; (2), 1 lb. (.45kg) weights; (1), 1/2 lb. (226g) weight; (1), 1/4 lb. (113g) weight.